Flexible material can be installed over stone walls & other irregular surfaces. 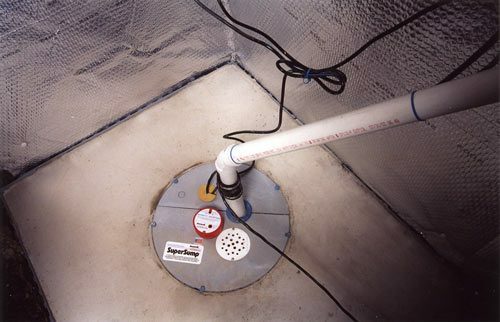 Compatible with WaterGuard® perimeter drain system. Drains all wall seepage into perimeter drains.. 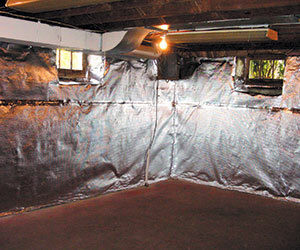 Improves comfort & energy efficiency by reflecting heat back into basement space. ThermalDry® Basement Wall Insulation is only available from a certified installer in your area. Contact us to request an inspection & get a free cost estimate to have it installed in your home. 3-in-1. 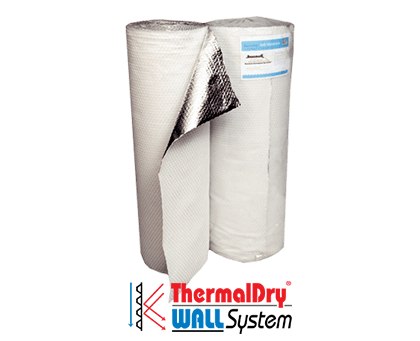 The ThermalDry® Wall System stops water vapor, drains wall seepage into your perimeter drain system, and reflects heat back into your basement space. The ThermalDry® Basement Wall System is an excellent product to install if you plan to finish your basement. With this system, you simply build new walls inside foundation walls finished with the ThermalDry® treatment. 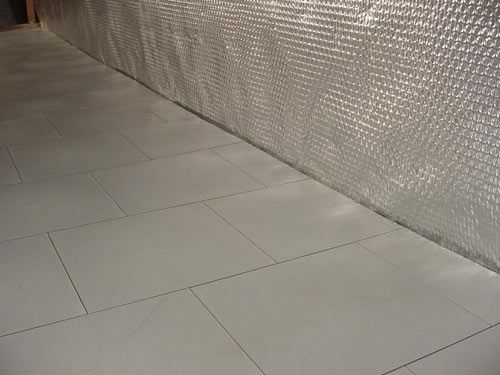 ThermalDry® wall covering is a flexible poly sheet material with "bubble-wrap" on one side and reflective foil on the other. 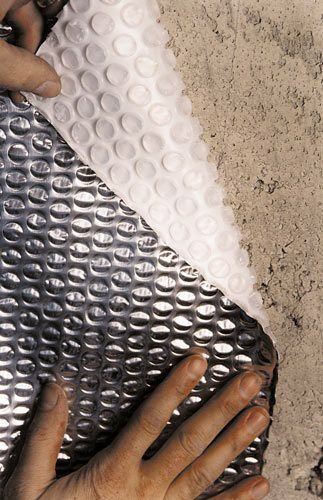 The bubble wrap creates insulating air spaces next to the foundation wall. 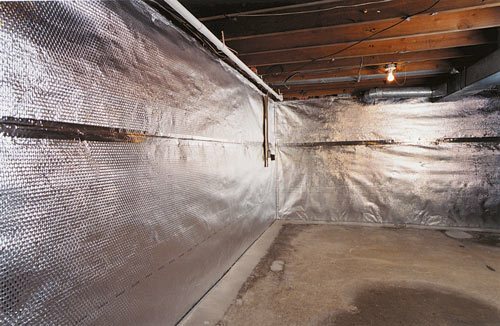 The foil-faced side of the sheet faces into your basement, reflecting heat back into the living space. During cold weather, a ThermalDry® wall will reduce the amount of heat that's absorbed by your basement walls. 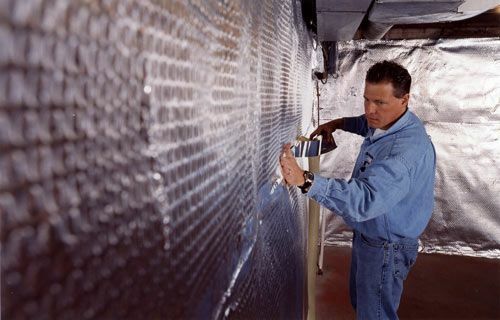 ThermalDry® wall treatment also creates an effective moisture and vapor barrier, helping to control basement humidity. ThermalDry® wall covering can be installed over concrete block, poured concrete or stone foundation walls. 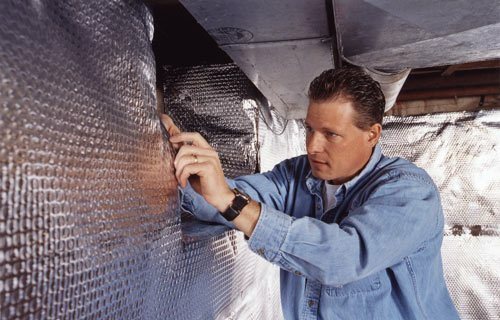 Our installers secure the sheet material to the wall with plastic, press-in fasteners. A typical basement installation can usually be completed in just one day. To get your basement ready for finishing, you can't beat the performance & value of the ThermalDry® Basement Wall System.